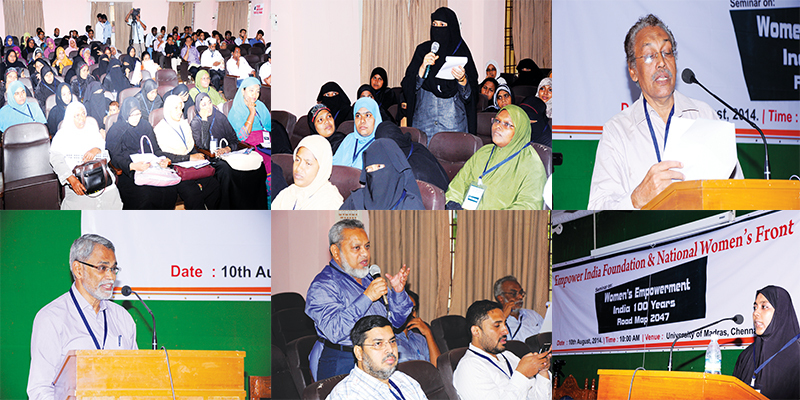 The Third National Seminar in the series was held in Madras University , Chennai on 10th AUG 2014 with the theme â€œWomenâ€™s Empowerment â€“ Roadmap 2047â€, jointly organized by Empower India Foundation & National Womenâ€™s Front. Many Intellectuals and thinkers from various fields including Professor Shanthi, Fathima Muzaffer, Professor A Marx, Mohamed Iqbal Qasimi, Professor P Koya, Sidhi Aliya and Dr. M Raziya Parvin participated and presented papers. The seminar was presided over by Muhammed Ismail, Secretary of Empower India Foundation.Â Â N. Mohammed welcomed the gathering. E.M. Abdul Rahiman, NEC member, Popular Front of India delivered the introductory speech and presented the theme paper. Papers on various topics were presented as shown below.